Analysis: The fight over the FBI director's firing will go on — and the DOJ inspector general's report provides plenty of reason for it. WASHINGTON — There's a choose-your-own-adventure quality to the Justice Department Inspector General's Office report on the FBI's investigation into Hillary Clinton during the 2016 presidential election. For Republicans who believe President Donald Trump is the victim of a "deep state" effort to undermine his campaign and his presidency, there are text messages from FBI agent Peter Strzok to his lover that contain anti-Trump sentiment — including that they would "stop" him from becoming president — and plenty of data points to suggest former FBI Director James Comey deserved to be fired for his conduct, rather than as an attempt to obstruct an investigation into his campaign's ties to Russia. For Democrats, the report acknowledges there's no evidence that pro-Clinton political bias drove decision-making; makes clear that the bad calls within the FBI and the DOJ, including Comey's breaks with protocol, tended to harm Clinton, not Trump; and, perhaps most important, concludes that the methodology of the Clinton investigation — and the decision not to prosecute her — was sound. The most compelling finding, one marbled throughout the 568-page report and which gives a sense of vindication to both sides, is that Comey repeatedly substituted his own judgment for department policy in making highly sensitive decisions to publicly reveal information about the Clinton probe. "The IG Report is a total disaster for Comey, his minions and sadly, the FBI," Trump wrote in a tweetstorm on the IG report Friday morning. "Comey will now officially go down as the worst leader, by far, in the history of the FBI. I did a great service to the people in firing him. Good Instincts. Christopher Wray will bring it proudly back!" 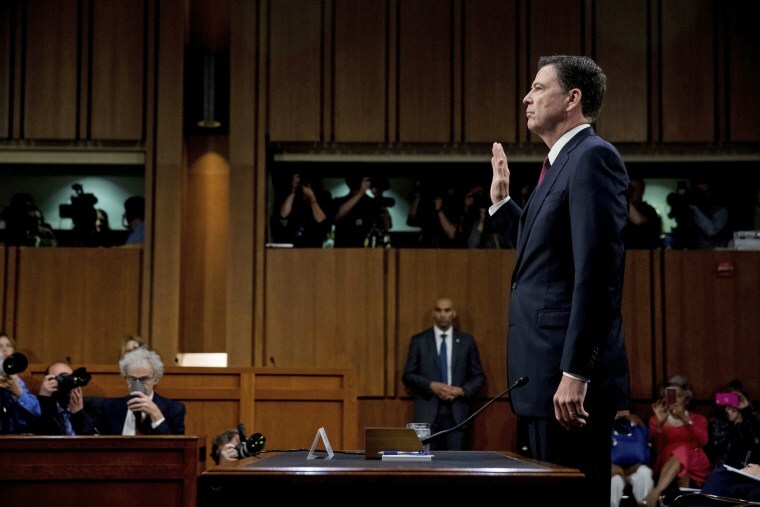 Specifically, the IG faulted Comey for going rogue by holding a news conference in which he discussed the particulars of a case against a person — Clinton — who wasn't going to be prosecuted, and for failing to directly discuss with Justice Department leaders his decision to inform Congress roughly two weeks before the election that he was essentially re-opening the case to look at Clinton emails found on former Rep. Anthony Weiner's laptop. "We concluded that Comey's unilateral announcement was inconsistent with department policy and violated long-standing department practice and protocol by, among other things, criticizing Clinton's uncharged conduct," the IG's office wrote at one point. "Much like with his July 5 announcement, we found that in making this decision, Comey engaged in ad hoc decision-making based on his personal views even if it meant rejecting longstanding department policy or practice," the IG's office wrote of the laptop call. Comey, naturally, begged to differ. "I do not agree with all of the inspector general’s conclusions, but I respect the work of his office and salute its professionalism," Comey wrote in a New York Times op-ed Thursday. "All of our leaders need to understand that accountability and transparency are essential to the functioning of our democracy, even when it involves criticism. This is how the process is supposed to work." He also pointed to two conclusions that he implied gave him comfort: The IG concluded there was no evidence of improper action in the investigation of Clinton — and that the decision not to prosecute Clinton was reasonable, as the IG wrote, "based on the prosecutors’ assessment of the facts, the law, and past department practice." In an exchange with reporters at the White House Friday, Trump bristled at the report's finding that prosecutors were not influenced by political bias. "That wasn't the correct opinion, and that was ridiculous," Trump said, as he implied that he had read the lengthy report. "That was the most biased set of circumstances I've ever seen in my life. Honestly, to read it was very sad." While the report does not in and of itself explore the question of whether Comey's firing could amount to an effort by Trump to obstruct justice, it does provide evidence that his dismissal could have been warranted for other reasons. Indeed, its conclusions reflect the case that Deputy Attorney General Rod Rosenstein made in a May 9, 2017, letter to Attorney General Jeff Sessions advocating for the removal of Comey based on his handling of the Clinton probe, and a contemporary letter Sessions wrote to Trump making the same recommendation. The IG's report might even be interpreted by some as exonerating the president on the question of whether he fired Comey for reasons other than his performance in the Clinton matter — if Trump hadn't told NBC's Lester Holt he made the decision based on Comey's pursuit of the investigation of his campaign's ties to Russia or if Comey hadn't said publicly that the president asked him for his loyalty. And it is being received that way by Trump's advocates. White House Press Secretary Sarah Sanders said Thursday that the report "reaffirms" Trump's "suspicions" about Comey's conduct. Republicans are also pointing to the report's finding that Comey had decided that Clinton's actions were not prosecutable in the spring of 2016 — well before he made the announcement — as a sign that the investigation was bent to fit the outcome he desired rather than based on the facts. Democrats, not surprisingly, have a different take on the totality of the report. "Every single public misstep by the FBI during the 2016 election damaged Hillary Clinton and helped Donald Trump," Sen. Pat Leahy, D-Vt., said. "That is why the president celebrated these mistakes at the time. That is why the story of Hillary Clinton’s emails was on the front page of every newspaper in the country, while the far more serious investigation into connections between the Trump campaign and the Kremlin was not." The IG spread a little bit of blame around — Loretta Lynch, the attorney general at the time, should have pushed back directly on Comey's plan to tell Congress the FBI was essentially reopening the Clinton investigation, for example — but focused almost entirely on Comey. Of course, it's not unusual for the lion's share of the blame for an agency's failures to be laid at the feet of someone who already has lost his job. And this report won't end the political and legal fight over whether Trump's motivations for firing Comey were appropriate. But there's broad bipartisan agreement in Washington that in assessing blame for the FBI's mistakes, the inspector general's office squarely hit its mark.